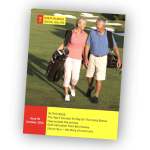 Club de Golf La Peraleja is located in the heart of one of the best Mediterranean resorts in the south-east of Spain, where there are fantastic weather conditions for playing golf. Peraleja Golf course was designed by Severiano Ballesteros, one of the greatest professional golfers ever. 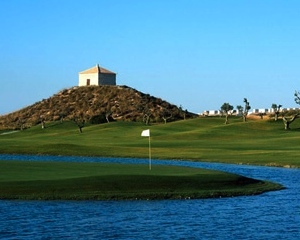 Peraleja Golf course has 18 holes, is a total distance of 6250 meters and is a par 72, it is a gently undulating course with strategically placed bunkers and lakes, designed to challenge the players throughout the whole round, making the game a unique and enjoyable experience. All services given was excellent, but the course was in appalling condition. Beautifully laid out course, design a credit to Seve, but so disappointed with the condition. We were warned that some of the fairways were under repair – and yes, some of the fairways are in pretty poor nick, especially the 15th and the 18th leading up to the green. Notwithstanding, the course is well set out and like most Seve designs, there are a number of challenging water holes where you really do need to know where to aim off the tee. The short par 3 16th is only a SW/PW into a small green protected by water to the front, right and rear and I wondered why the four ball in front of me all played into the shallow bunker to the left of the green. Two shots later, both on the green, the first rolls back into the water and the second rolls past the flag over the green just playable in the hazard. A six at the most innocuous of holes! Overall, apart from some slow play on the back nine, I enjoyed Peraleja and the pro shop staff were friendly and helpful. I visited this course on the 30th September 2013. The design of the course is in general good, with some challenging, yet short holes, with water and bunkers strategically placed as you would expect from a Seve designed course. Here the compliments stop, my first drive stopped in the “fairway” approximately 200m from the flag, however after finding some grass to play from my second shot was some 235m from the green. Arriving on the green was a shock, they were in places bare with the signs of badly performed hollow tining procedures. In fact a lot of the greens showed more signs of poor maintanance than they did grass. All of the fairways had large bare patches which in general were at the landing zone for drives.